Chocolate! What is not to love about it!!! 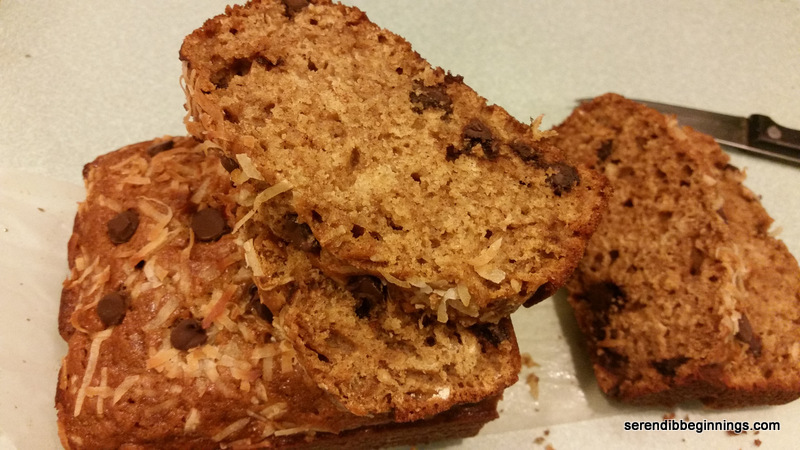 This recipe is a spinoff from the original recipe for Cinnamon-Swirl Chocolate Chip Bread by Sally’s Baking Addiction. The first time I baked this bread, I must confess I felt like I was transported to a great pastry shop somewhere! The smell of chocolate and cinnamon permeated the entire house and had my kids dash to the kitchen wondering what was baking! To top it off, I took some of the bread to work that morning (yes, the bread still slightly warm…needless to say, everyone raved about it and I obviously gave credit to Sally. I knew after the first loaf that this recipe was going to be keeper, but I wanted to find a way to “healthify” it up a little! I thought cutting down the sugar content was quite easy to accomplish. Sally’s recipe calls for 1/2 cup of sugar with cinnamon to use in the cinnamon layer. Personally, I could do without it! 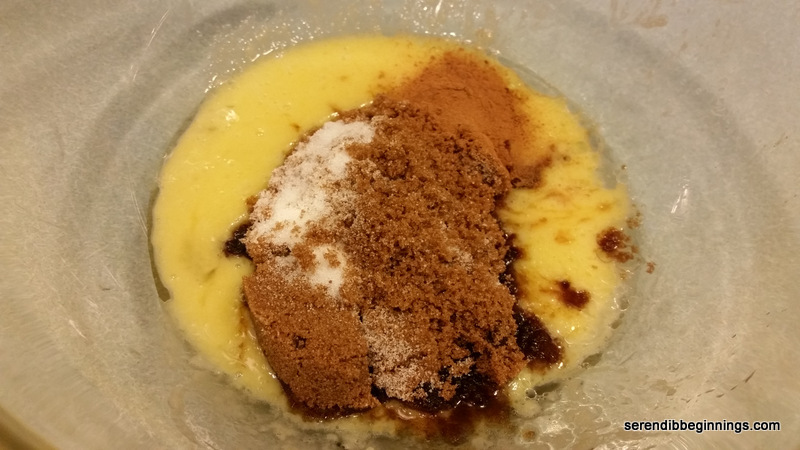 So, there it is – my first calorie-saving switch was to eliminate the cinnamon sugar layer and instead use 1 teaspoon of cinnamon in the batter! Calorie-saving tip #2 – replace some of the oil with unsweetened applesauce! 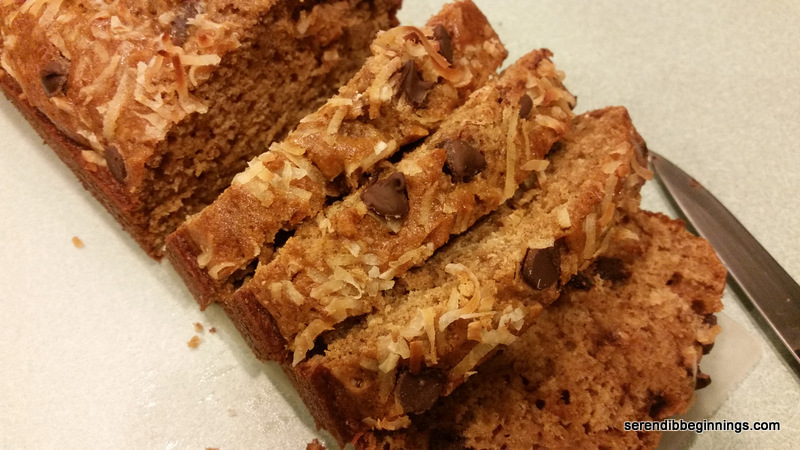 I substituted half the oil with the applesauce and you wouldn’t miss much of the moistness! 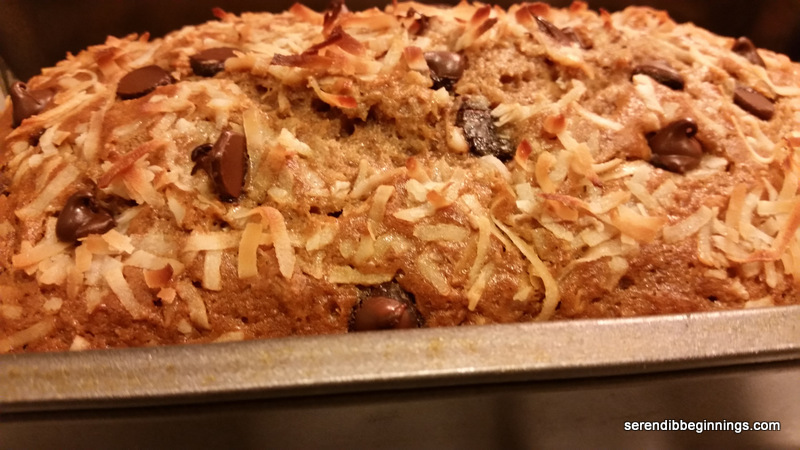 Next time, I am going to try it with pureed prunes instead of applesauce to see how it turns out! I would imagine it will result in an equally delicious loaf with darker color! Yum! 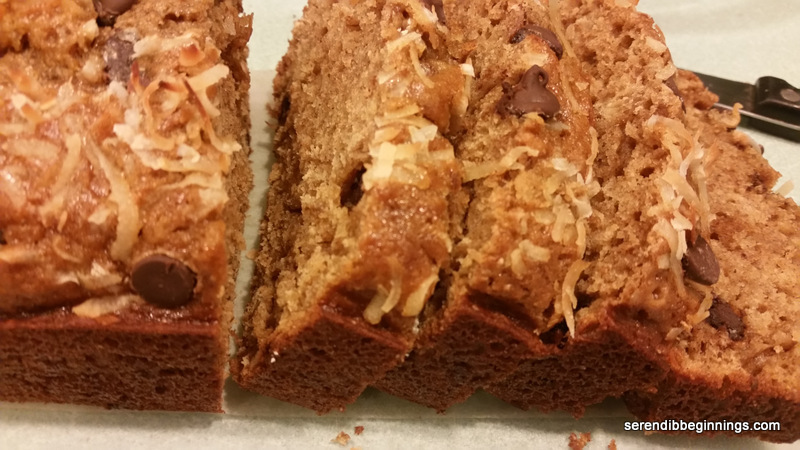 “Lightened Up” Version – Can you tell the difference except for chocolate chip topping vs. chopped chocolate? This recipe is pretty simple to put together. As usual, measure out the dry ingredients, whip up the wet ingredients and fold in the dry into the wet making sure not to release your stress during the mixing process! 🙂 Gentle does it! My recommendation is to save your stress release for another bread recipe that calls for extreme amount of kneading! Gentle mixing results in a lighter bread that is not tough! And oh, another word of caution…this bread takes a long time to bake – almost an hour! So, you have to be patient! 1. Preheat oven to 350F; Spray a nonstick loaf pan with cooking spray on all sides and set aside. Alternatively, you can lay a piece of parchment paper on the bottom of the pan and spray over the sides of the pan. Parchment helps to remove the loaf easily from the pan. 2. Measure out the dry ingredients and sift into a medium bowl. 3. In a large bowl, whisk the egg. Mix in the sugars till all lumps are broken down. 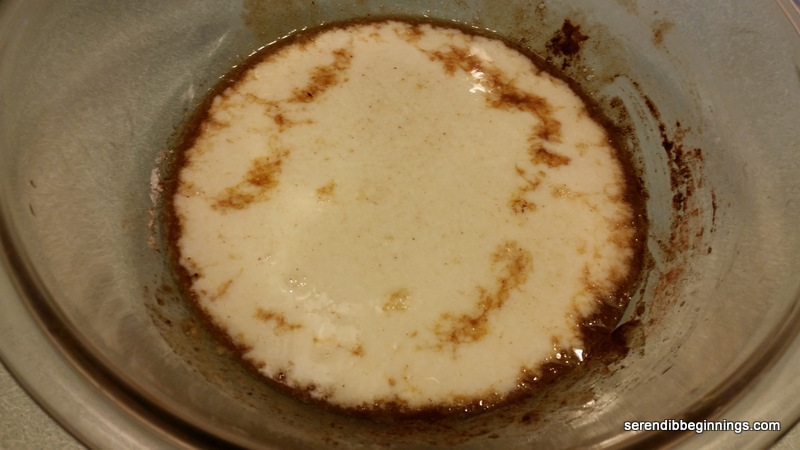 Stir in the buttermilk, applesauce-oil combo and vanilla. 4. 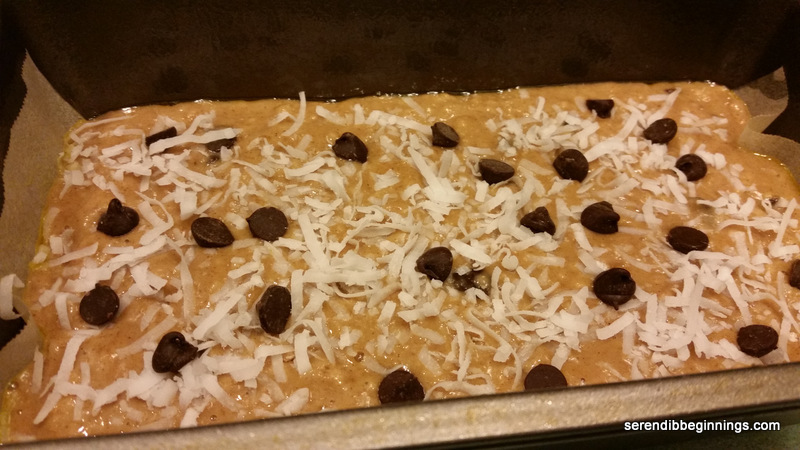 Slowly stir in the dry ingredients, along with chocolate chips taking care not to overmix. 5. Spoon the batter into the prepared loaf pan. 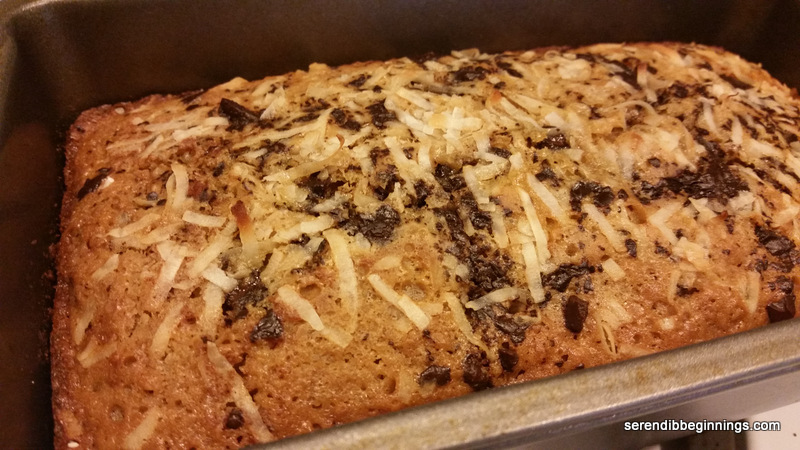 Top with some sweetened grated coconut (optional) and additional chocolate chips. 6. Bake for about 50-55 minutes till the bread is baked all the way through (confirm with the usual toothpick trick!). 7. Remove from oven, let cool in the pan completely. If you are in a hurry like I was the first time I baked, let cool for 10 minutes in the pan and carefully remove taking care not to scorch yourself (not advisable). Transfer to a cooling rack. Bread will stay fresh in a tightly closed container at room temperature for about 5 days.